Rutgers in the News. Again. Rutgers in the [national] news. Again. And not for something good. As a Rutgers (New Brunswick campus) alumni, the thought on my mind since yesterday was something to the likes of “it would be nice for Rutgers to get [national] media coverage for something positive for a change“. Do I believe Mike Rice deserves to be fired for his actions? Absolutely. But now? No. The time for that was in the aftermath of when the school officials first became aware of the incident(s) in question. Sure, Rice was suspended for several games at the point. But if that was the punishment then, then why fire him now if there are no new incidents? Why now? To save your own jobs because the national media picked up on the leaked video? That’s ridiculous. The incidents in question were just as horrendous months ago when the mass public didn’t know about it. Several months ago? That was the time to take decisive actions. That was when the athletic department at Rutgers needed to stand up for their players and do what’s right. That was when firing Mike Rice would have been justified. Not now. Not when you take actions because you have to save yourselves. Not when you are only doing it because the mass public finds out about it and you have questions to answer. Rutgers is better than that. The sport, not the insect. I don’t understand it, I don’t like it, and I certainly don’t have the patience and/or attention span to watch it. Do you know how long those games are? 8 HOURS! Sometimes, they take FIVE days! That means 8 hours X 5 days = you must be crazy if you think I’m going to watch that. The rest of my family LOVES the sport. The World Cup just ended on Saturday and so around my house it was cricket time, all the time lately for quite a while. Pakistan (where I was born) lost in the semi-finals, and the final game was between Sri Lanka and India. All I’ve heard lately is about cricket, and frankly I’m over it! Before I end for the day, I’ll share a related joke my dad shared with me yesterday — Just saw a Sri Lankan drinking tea from a plate, he said the Indians took the cup. Are you guys into the March Madness craze? I’m DEFINITELY not. I watch none of the games. I don’t care who wins. 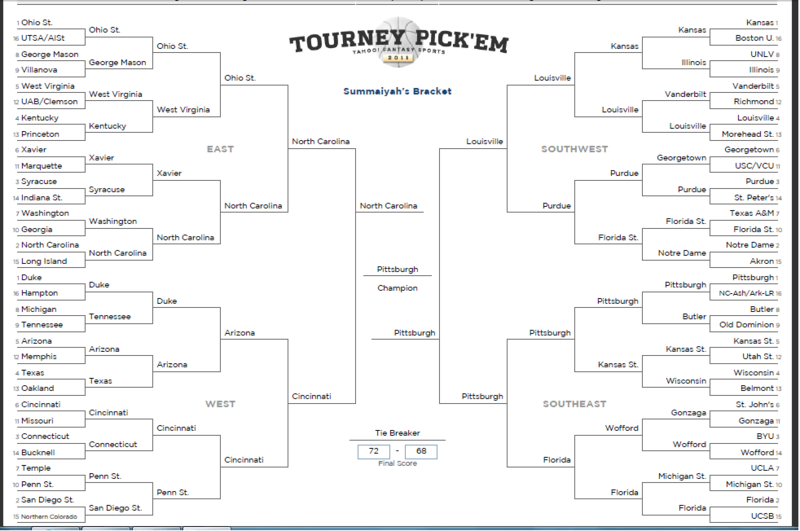 But for several years now, I have filled out the bracket for the heck of it…. using my method. You know what that is? As I go through the bracket, I look at the names of both teams in a game… and choose which ever name sounds better. Ingenious, no? Go ahead and shake your head in disbelief but two years ago my method led my bracket to be more accurate than BOTH of my brothers. You know, the ones that live off of sports and would probably watch all 16 games in a day at the same time if it was possible. Overall, my method leads to me to do pretty well each year. The only team I didn’t pick on purpose was St. Johns… because of how Rutgers (my alma mater) was ripped off in the game against them. FYI, for the final score (for the tie breaker)… I totally just pulled out random numbers. My brother, Faraz, just shared this video with me and it is hilarious and cute (but I don’t condone or appreciate that kind of language from kids that age). On opening night of baseball, five-year-old Joshua Sacco gave the speech that the Team USA coach Herb Brooks gave to his team (before ‘Miracle on Ice’) to the Red Sox. I, personally, think it puts creepy to a whole new level. And to use a dead person for personal gain – how terrible! Not to mention your own father! How demeaning. Was this suppose to gain him sympathy votes? Seems like just yesterday that we were watching the opening ceremony of the Olympics in Vancouver, British Columbia… and now it’s already over! I love the Olympic events, but never get a chance to watch as much of it as I would have liked… but always have fun watching what I do get to watch. Figure skating and ice dancing are my favorite events to watch in the winter games- and neither disappointed this time around. Canada not only got it’s first gold medal while hosting Olympics (this is the third time they have done so), they got fourteen of them! That’a s record, I believe. The Vancouver games came with more than its fair share of sad events (read here and Joannie Rochette’s mother passing away two days before her events were to start to name a few) that will definitely be associated with the Vancouver 2010 games. There were some sad times, but some great memorable ones too (the first gold medal on home soil, getting a record number of gold medals, Canada beating U.S. in ice hockey in the final, the Canadian gold medal in ice dancing are just a few). Unfortunately, due to a prior family event commitment, I missed the closing ceremony last night – but I’ll hopefully catch it sometime this week. I saw a quick clip last night about Canada mocking themselves from the glitch in the opening ceremony where the fourth pillar wouldn’t open (remember that?) and in the same act – they brought the woman who was supposed to be one of the four to light the cauldron (but couldn’t because her pillar was the one that got stuck), light the cauldron last night. I thought that was a nice way to round off everything and bring everything to a full circle.